Shieldaig’s friendly local bar and Coastal Kitchen restaurant has a magnificent situation on the sea front in the centre of the village and we specialise in meals featuring, among other seasonal local produce, fresh local seafood delivered straight from the jetty to the kitchen door each day. Enjoy the local “craic” and foaming pints of An Teallach Brewery real ales downstairs, or book a table upstairs in the Coastal Kitchen – all with fabulous views across the loch to Shieldaig Island (home to our nesting pair of sea eagles) and the open sea beyond. We regularly have live traditional or folk music in the bar on Saturday evenings. 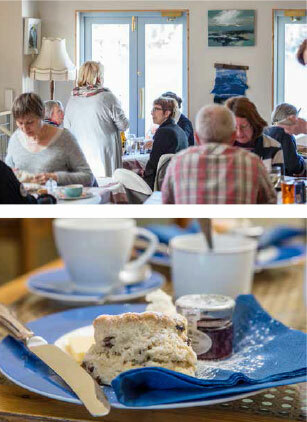 Everyday enjoy tea and scones and other home baking and on Sundays enjoy our fabulous brunch over your morning papers.